Sha Blackburn is; The LoonWitch a psychic intuitive healer. She incorporates a variety of psychic tools including the tarot, runes, the pendulum and psychometry to help her clients transform their lives. 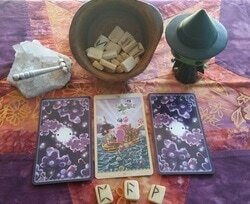 She is an honest and insightful psychic, who has been studying and practicing various forms of divination for over 30 years. Sha is also a Reiki Master in the Usui System of Natural Healing, a HolisticTherapist certified by the American Institute of Natural Healing in Reflexology, Acupressure, and Chinese Herbology. In addition, Sha is an ordained minister through the Universal Life Church. Sha is a gifted teacher, helping adults and children define their spiritual path and work toward a happier future. Sha has been teaching about the Tarot, the Aura, and Witchcraft for many years. She has taught at The Learning Connection in Providence, RI; The SouthCoast Learning Network in New Bedford, MA, in her own sacred space and online! The LoonWitch was a guest on WFHN – Fun107’s Free Fortune Friday for 12 years! Sha is active in the local pagan community as the High Priestess of the Order of Blended Wisdom, an eclectic spiritual group. She facilitates open rituals with the OBW. Sign up for my mailing list and enjoy coupons, discount and special events as well as the most up to date information about where I will be teaching and reading. The LoonWitch Offers A Village Witch Service, She Will Make A Charm For Any Needed Purpose And Guide You In Working Spells To Create Your Own Needed Outcome. All Charms Are Worked In The Correct Moon Phase And May Contain Herbs, Crystals, Incense, And Other Items.